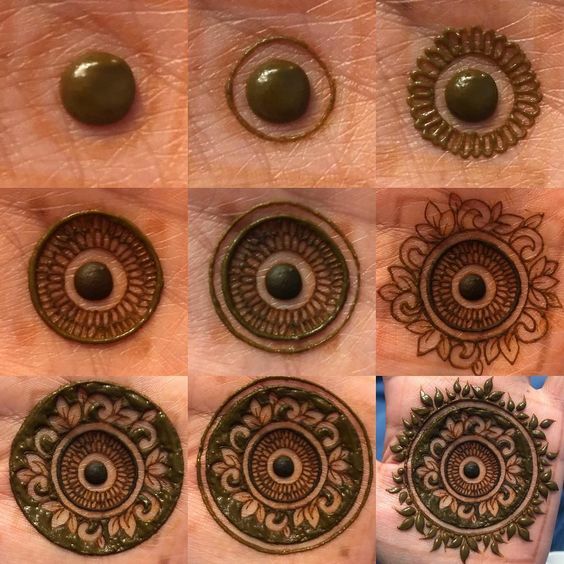 Mehndi designs are adored by women from all over the world - In India, any Ritual/Function is incomplete without a Henna design as it not only beautifies your hands but is also surmised to bring good fortune. From simple geometric patterns to delicate florals, sensuous curves and bold motifs, a mehndi design has something for all tastes. Bridal mehndi has become very popular among Bride's where they express themselves with new and exquisite designs. 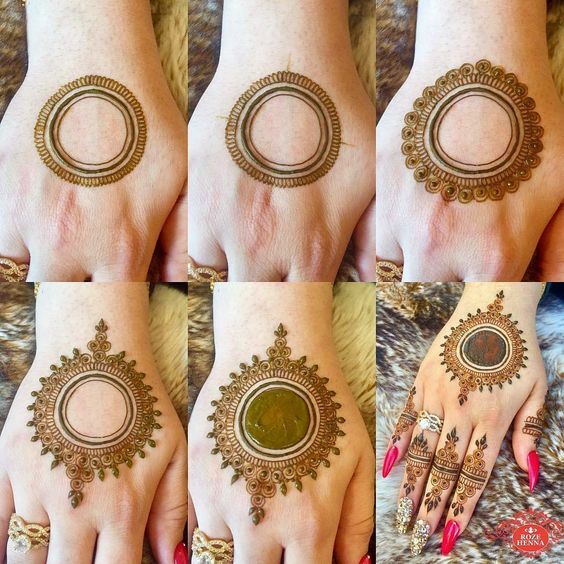 You might be accustomed to seeing elaborate, intricate and complicated mehndi designs during weddings but there's no need to worry as there are also some very easy and equally pretty simple mehndi designs which look gorgeous without leaving you with a tired hand and an irritated mind. 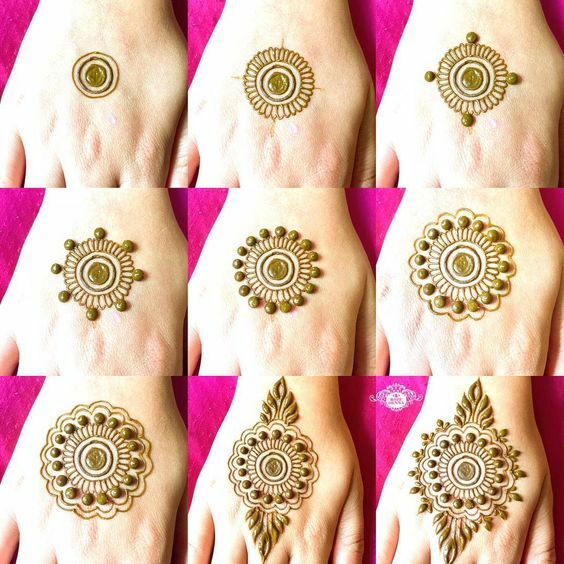 These mehndi designs require very less time and are simple ones which add a hint of colour to your hands without giving you a cluttered feel. 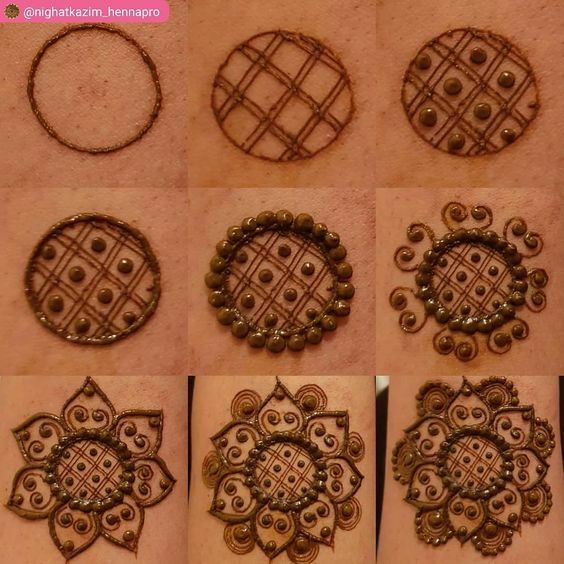 The art of drawing Henna mehndi patterns is not a job reserved for professionals and just anybody can master it with a little practice and some inspiration! 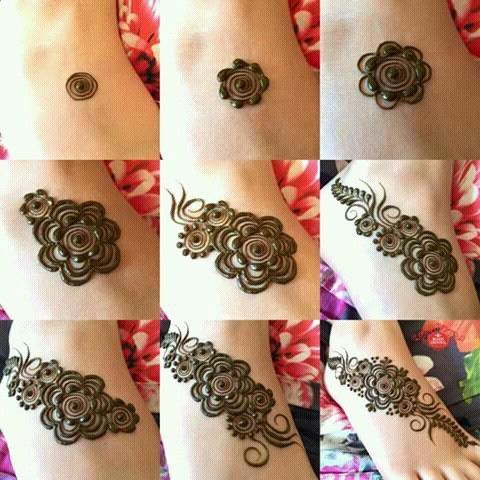 I feel every girl shares a special bond with Henna mehndi and the desire to draw lovely Henna patterns is always there!. 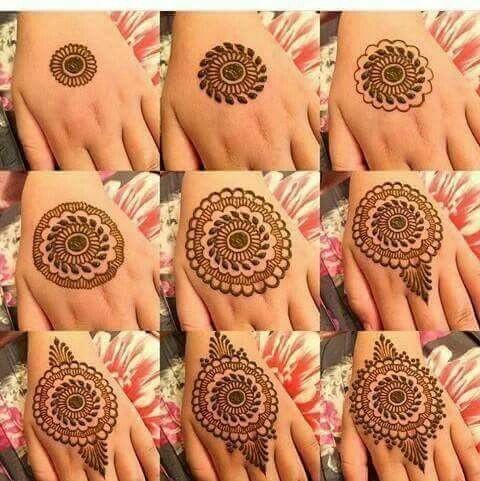 If you are a beginner who is just trying to get her hands on the beautiful Henna art then you are at the right place! 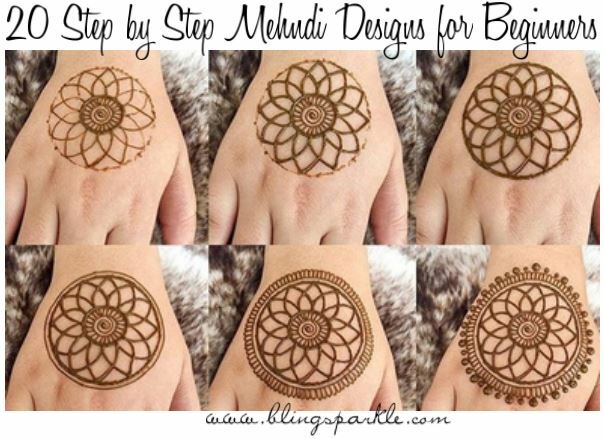 Above is a very beautiful yet simple step by step mehndi design for the back of your hands. This pattern will look equally good on your palms and is just what you need to slay when paired with your favourite ethnic lehenga or Anarkali for the occasion. This mehndi design will surely draw attention to your hands and give you that 'out-of-the-world' feel! Start with drawing multiple circles as shown in the first image and carefully graduate by outlining your circles with tiny dotted circles and finish off with cones and you are done! 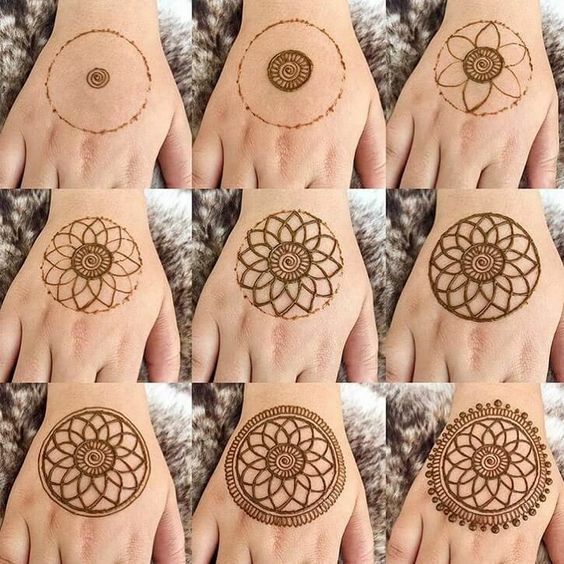 You can never go wrong with Floral motifs especially when it comes to henna art. 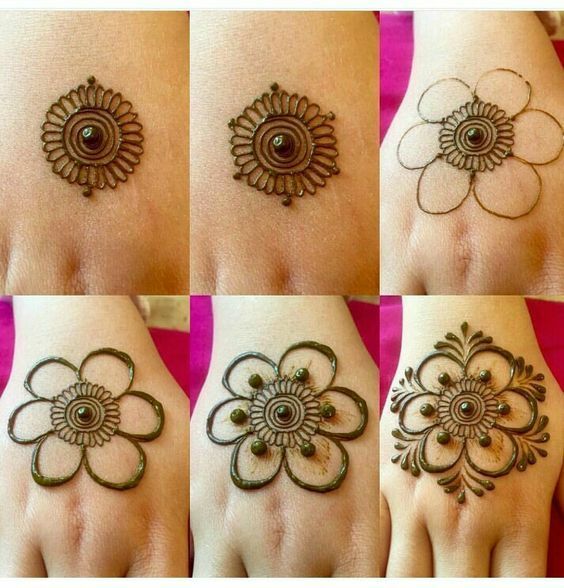 Floral Henna designs look absolutely gorgeous and instantly give you that push you need for your special occasion. 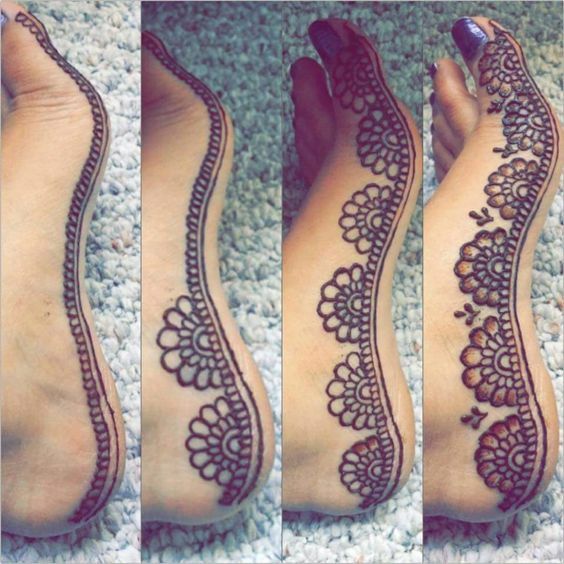 The above floral mehndi design is super pretty and easy to to achieve too. 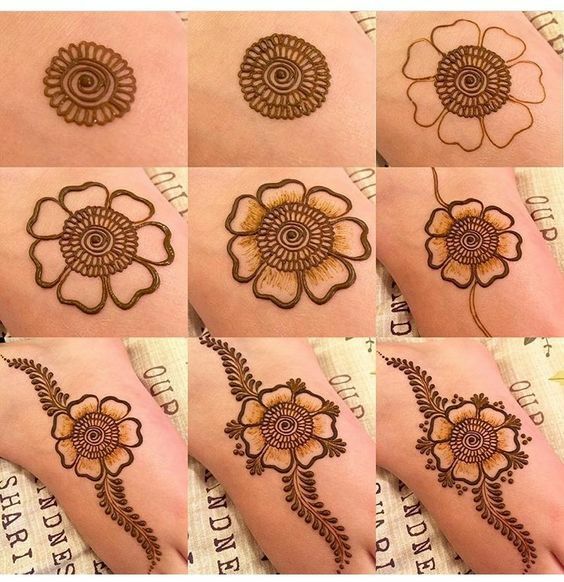 Remember that the trick here is thickening the outline of the petals (as shown is pic 3 and 4) which makes a huge difference in the beauty of this Henna pattern! If there is anything which is ruling the Henna mehndi patterns this year, it's the rose mehndi designs! Roses top the charts of the most loved flowers and including them in Henna patterns has become a rage these days thanks to their sheer beauty and elegance! 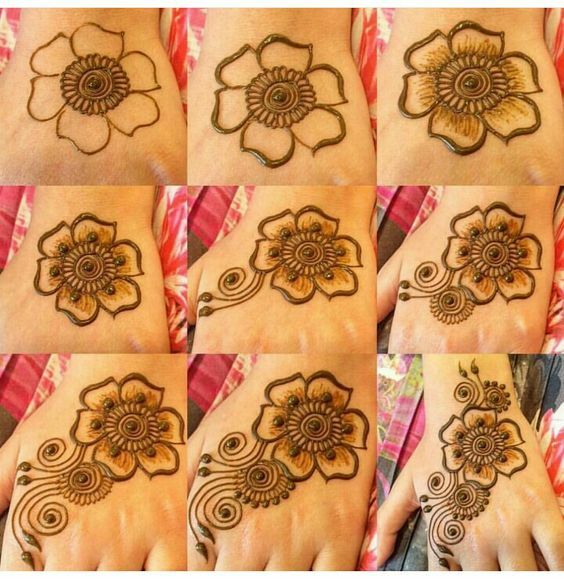 The above rose mehndi design is super simple and absolutely gorgeous. 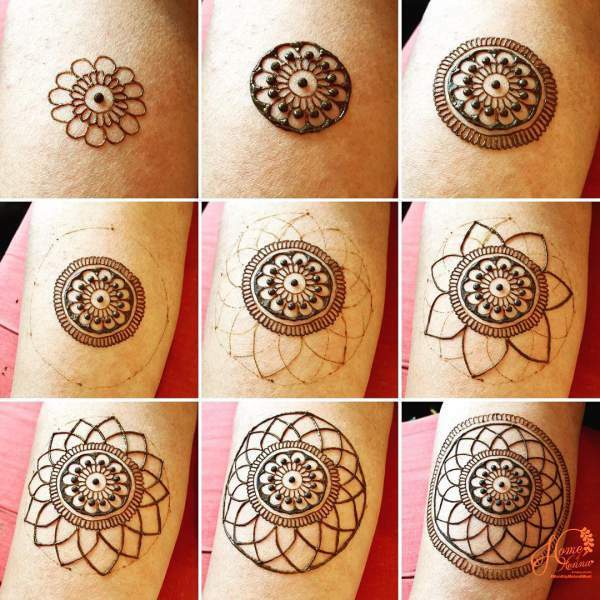 If you are a beginner than starting with floral Henna designs is your best bet. Who says Rangoli was meant to beautify only your home, now you can decorate your hands with it too! 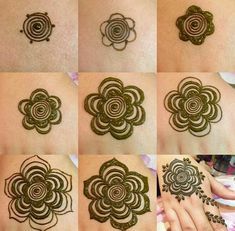 The above rangoli inspired mehndi design is perfect for a festival like Diwali etc and it is quite easy to achieve too. Nothing shouts 'easy' like Dots do and the best part is that you can acieve amazing designs by just connecting few dots in some creative ways! The above design is super cute is easy to achieve. 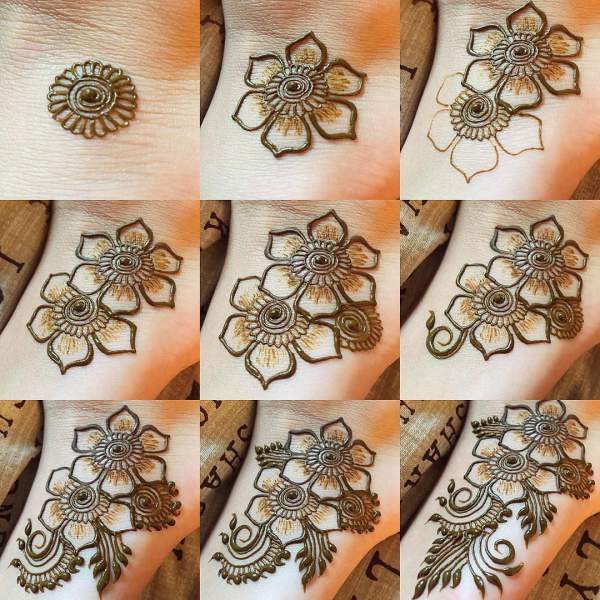 A perfect bet for beginners in Henna mehndi patterns. 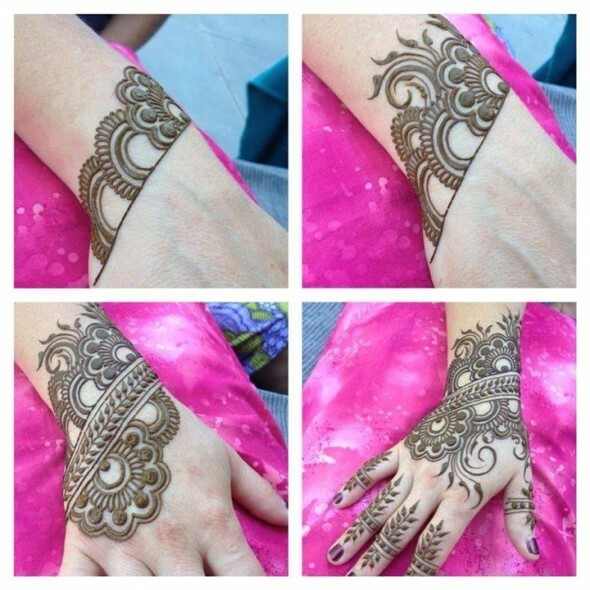 Jaali mehndi designs or Netted mehndi designs have a charm of their own and they are my personal favorite. 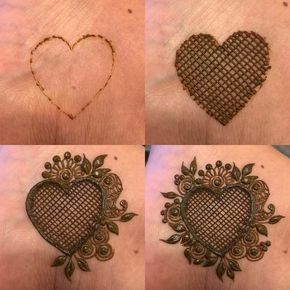 You can start with this above simple netted heart design and slowly graduate to these Jaali mehndi designs which look absolutely gorgeous. 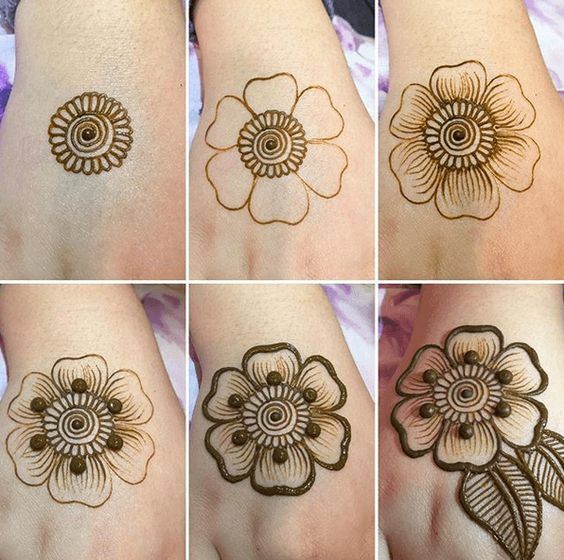 Shaded flowers look very pretty and the above mehndi design is a small example of it. 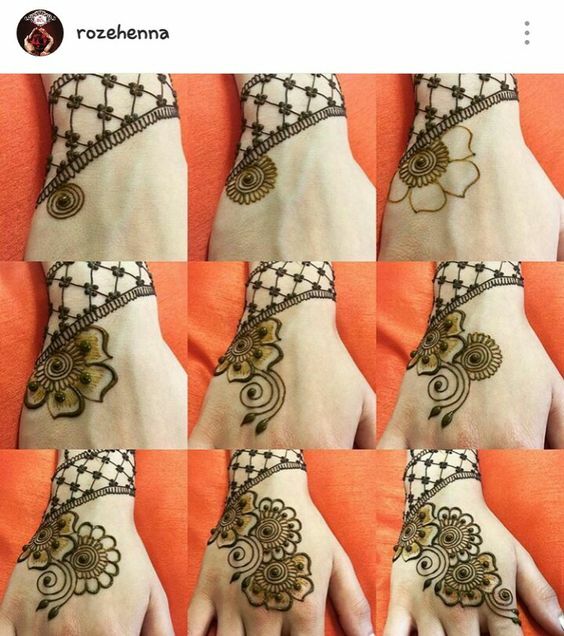 Geometric mehndi patterns have been a favorite among many women. They have that bold vibe to them which goes well with both your Western and ethnic outfits. 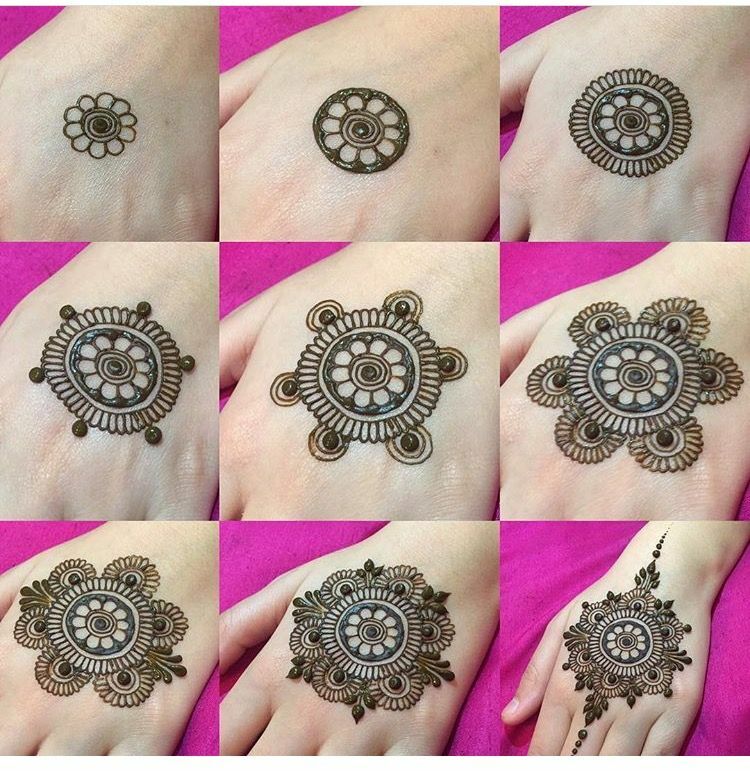 Another netted/Jaali mehndi design inspiration which is super easy to achieve. 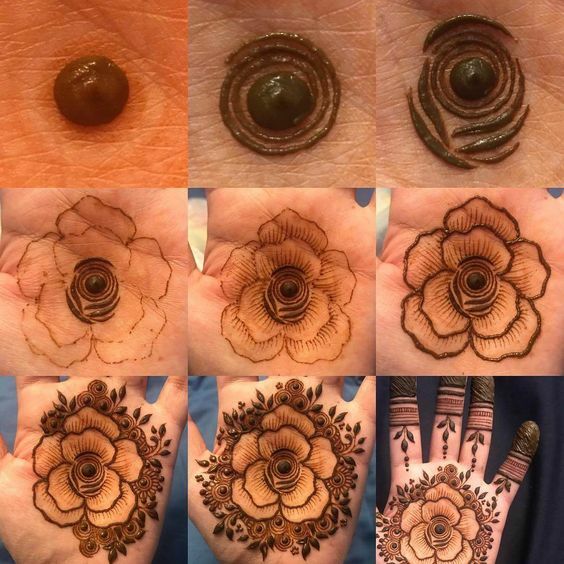 Simple Flower Mehndi Design - Step by Step for Beginners.